Luke gets closer to the truth about Reva and her part in his fate, while Mariah wrestles with the morality of her role. Misty hunts for Luke. Patty: You'd think a sister in charge would change things. But you're blue, which makes you just as white as anybody else! Damon: You can't be trusted. Mariah: Who needs trust when you have power? 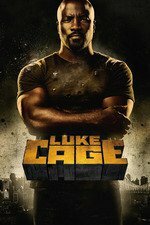 *Claire McGuyver's a defibrillator by throwing a hot-plate into the acid bath, figures out that the temperature of the acid bath matters more than the PH level, and successfully extracts the shrapnel from Luke's shoulder (no mention of the shrapnel from the first bullet, guess we're meant to forget about his gut wound?). *Claire and Luke look at Reva's prison vlogs, discovering she knew all about fight club and the deadly experimentation on prisoners that Luke was to be part of. Luke trashes Burstein's barn-lab, to keep him from further experimentation. *Stryker impersonates Cage, uses a powered glove to kill a cop with one punch. The cops go on a rampage looking for Luke, and one beats up Lonnie (Patty's kid from the barber shop) in the interrogation room. Mariah uses the beating to, as Stryker suggested, 'get her Sharpton on', speechifying in front of the precinct against police brutality and Luke Cage, and calling for a rally at Harlem's Paradise. *Misty identifies Stryker with facial recognition software, researches his sealed juvie record and learns that he and Marc Lucas stole a car, recognizes that Lucas is Cage. *Luke and Claire look at Seagate Prison island from the shore, talk about Reva, decide to go to Savannah. His father's church has been abandoned/trashed, but in flashbacks Luke finally realizes that Willis is his father's illegitimate son. *Burstein cobbles together his laptop in the lab-wreckage, his copy of Revel's files are intact. *Misty goes to Domingo's gym to ask about Stryker, he points her to Harlem's Paradise being under new management. *Mariah gives her speech at the Harlem's Paradise rally. Misty goes upstairs to get Stryker, but he gets the drop on her and shoots her. Luke sweeps her up and shields her from further bullets, then leaps down to club level, and the episode ends with them behind the bar, huddling together against a hail of gunfire. According to the AVClub recap, one of the signs being held up at the anti-Luke Cage rally said, “The only superfreak we like is Rick James”. I'm just not digging Diamondback. His coincidental relationship with Luke I might have forgiven, but he's just so much more cartoony than the rest of the villains in the series -- and in Marvel Netflx as a whole. At least Cottonmouth had charisma as he screwed up his crime syndicate. The thing that gets me is that Diamondback and Luke Cage look nothing alike. Which, okay, racism means that I could get while the white people and maybe the police would not be able to tell the difference, but I was hoping that at least one person would mention it as a possible issue. Those flashbacks in the church were really well done, I thought. The transition from past to present, current Luke in the mirror. Hopefully he gets fleshed out a bit. I just have a sinking feeling he'll be around for longer than Pop was and he'll still feel like a silhouette of a character. I was disappointed that we didn't get a scene between present-day Luke and his father; watching this episode it seemed like that's what they were building up to, so the flashback was underwhelming to me. Maybe they didn't feel the need to introduce his actual father when they already had the father-figure of Pop, but it still seemed kind of silly that Luke had to drive all the way to the church just to jog his memory rather than him learning something he didn't previously know, from speaking to his father or someone else there. This is the episode where I finally said "okay, they are trying to do too much here." We could have had Diamondback as an unseen bad guy for the whole season and the show would have been better for it. Give us more time with Cottonmouth, then more time with Mariah figuring out her role without him. Even more Shades without Cottonmouth. Let each episode breathe a little more. People have already complained about the comic-book science in the page for the previous episode, but the part that bothers me happens here. In the previous episode, they say outright that they'll need saline and that the temperature is important but they don't know what the right temperature is. Here, they act like they don't already know that. Like they're improvising and coming up solutions on the fly, but they're exactly the solutions they discussed beforehand. I loved Lonnie Wilson's confident "Luke Cage was innocent and you got no reason to keep me here," although it seemed like sort of a repeat of the Misty/Claire interrogation scene, and I had a real hard time believing the cop would actually beat the kid's face bloody like that. Mariah is still fantastic. She really nails that kind of politician who is charismatic but whose speeches and arguments don't always quite make sense or make leaps of logic that sound good but leave you saying, "Wait, what?" The scene where she and Lonnie's mom are confronting Misty and her boss was pretty great. Okay, but I'm boggling at the leap of logic from "cops are beating up our kids" to "we need to arm the cops with more dangerous weapons," I don't care how charismatic you are, that is a tough sell. She tried to sell it as "Cops are hassling our kids because they don't have the firepower to go after the real threats," which I thought was pitch-perfect bad politician-logic. Yeah, the crowd getting behind Mariah seemed a bit forced. I'm justifying it by saying that's why she held her rally at the club. That place has got to have a capacity of, what, 300? Max? And it was full, but it wasn't packed. That's a big turnout for a speech by a city councillor, but she's clearly not speaking for all of Harlem. The small room made her pitch seem more popular than it was. I wish they'd done more to show that this was a legitimate grievance of the community that was being twisted to political ends. They way it was presented read uncomfortably like the corrupt politicians were creating the racial unrest. The science plot was not just comic booky, but it was never clear to me whether or why they were trying to recreate the conditions that gave Luke his powers. There is something interesting here about the way that genre tropes can stick out at odd angles in shows like this that otherwise try to downplay them. For the most part, this show is like The Wire, if there happened to be a bulletproof guy in the middle of it. But eventually you have to explore the limits of his powers -- because it is an obvious source of drama -- and then you get into sci-fi territory. And this show isn't really prepared to play out a realistic sci-fi plot, so you get a disconnect between the (relative) realism of the social/political landscape and the fantasy of abalone shells and boiling acid giving a guy superpowers. Agree with Dinty_Moore, even the fuzzy image that Misty was looking at was clearly not Luke Cage. Stryker has forehead two city blocks wide. Agree with oh yeah!, it seemed like a long drive just to jog Cage's memory. The flashbacks themselves had dramatic weight, but the way they were unearthed felt like a short-cut.